Less sliding and high efficiency compared with worm types. Requires less power under the same output conditions. Particular emphasis on the height dimension, this reducer is extremely short and compact. Ensures low-noise and highly-reliable operation taking advantage of our machining technology gained through our experience of manufacturing gear motors. Pre-lubricated with grease, this series can be used as is. Compatible with any mounting directions. The output shaft end is tap processed as the standard specification. For the hollow shaft type, an optional torque arm and shaft end cover are available. 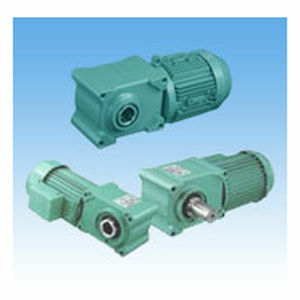 Inverter motor type with the same motor dimensions as standard motors are also available. Provides a wide range of options as well.